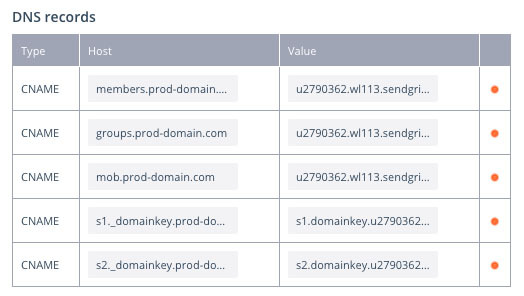 Mobilize can be configured to deliver emails on behalf of your email domain. This doesn't mean the email will come directly from your email provider (e.g. Gmail), instead it will be sent on behalf of your domain through Mobilize's mail servers. What happens if I don't configure a custom email address? 3. To complete the setup, five DNS record changes are required to verify ownership of the domain. You may require someone from IT to help with this step as it requires logging into the host provider account where you registered the domain name. Note: Do not use the values below, this is just an example. Please use the values listed in your account. For some DNS providers (like GoDaddy and Cloudflare), the "host" field should contain only the initial value. Replace "members.prod-domain.com" with "members". The same goes for "groups", "mob", "s1._domainkey" and "s2_domainkey". More details in this article about GoDaddy and Cloudflare. 4. Once you've made these changes, you can notice status changes happening to your DNS records. Changes to your DNS records can be immediate or may take hours to update, depending on your provider. Our DNS test will only detect live changes. 5. When a change is verified as correct, a green tick appears in the Status column. When all of the DNS changes are verified, click the "Activate" button. Once you have configured your domain, your community managers (all group managers, community managers and Account Owner, it will not be sent to members) will receive an email telling them about the change. Note: If you need to change your email domain once it has been configured, please contact us.